Save time and eliminate scheduling confusion. Spend more time growing your business and engaging with customers. 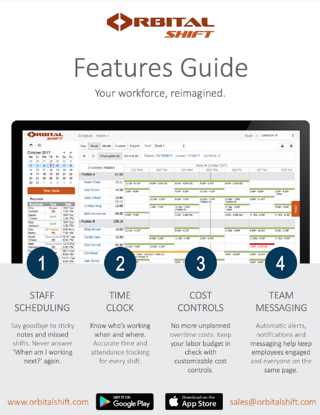 Orbital Shift offers an innovative workforce management suite that is purpose-built to engage your employees and empower your managers to thrive in a fast-paced competitive world. Access your copy by completing the form on the right and clicking SUBMIT.